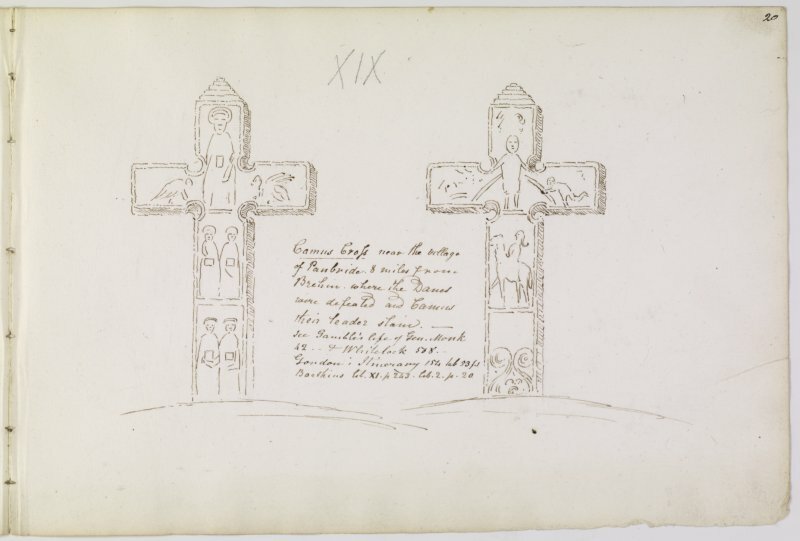 Annotated drawing of both faces of Camus's Cross, from the James Skene album, page 20. 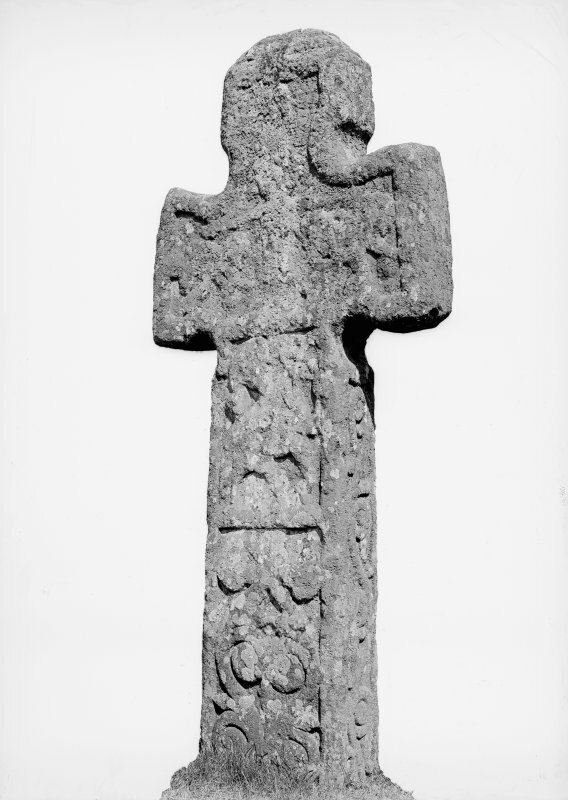 Detail of figures on reverse of shaft of Camus's Cross. 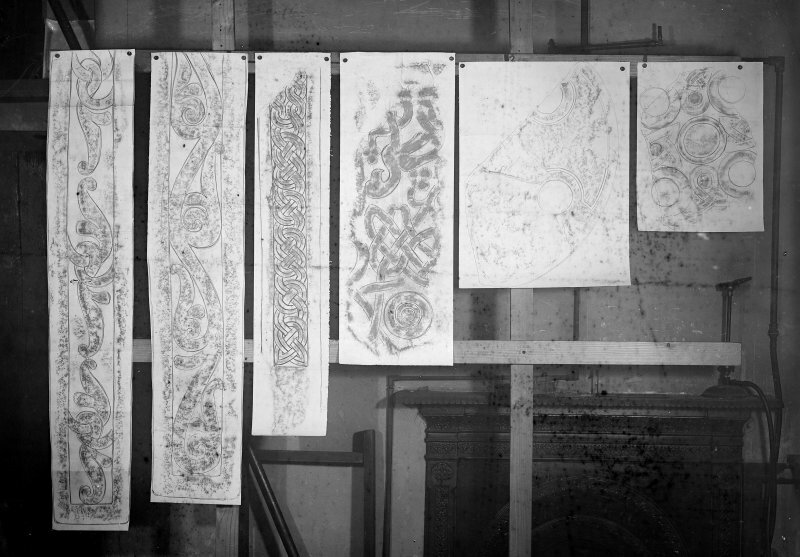 Photographic copy of six rubbings. 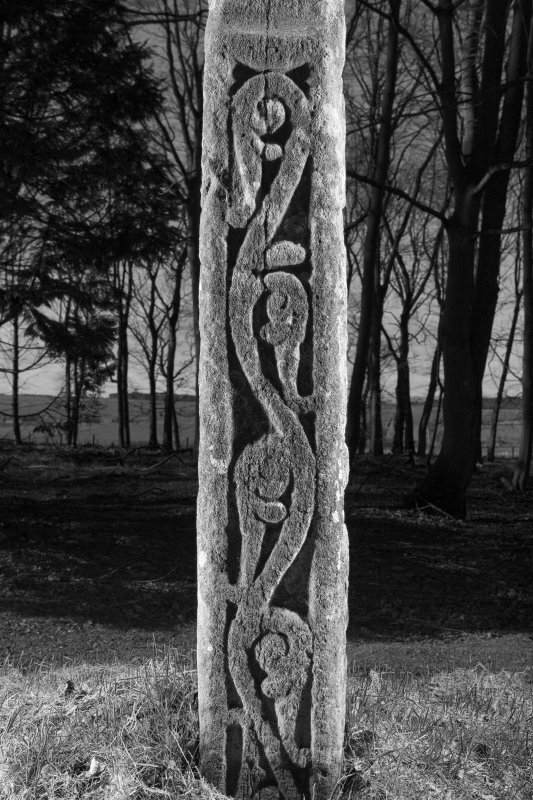 The middle two rubbings shows unidentified carved stones and the two rubbings to the right are of stones located in the Whithorn Museum. 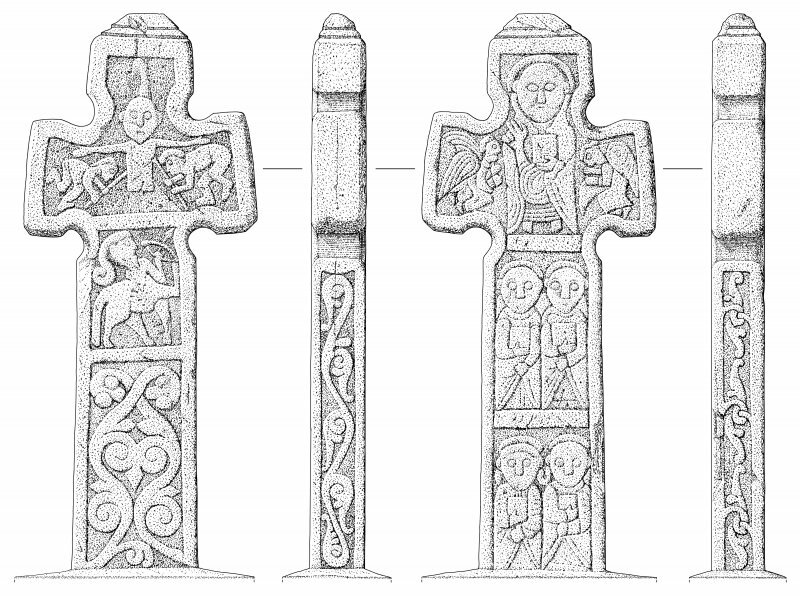 The two rubbings on the left depict sections of the Camus's Cross. 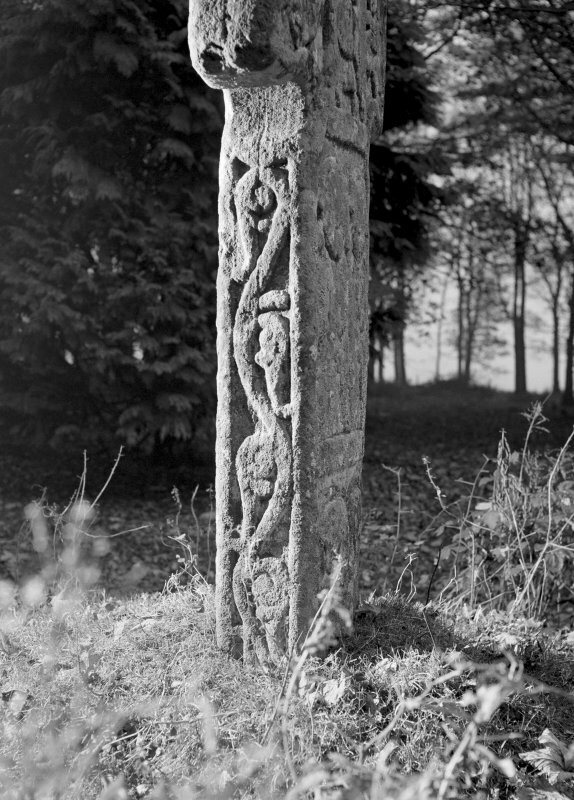 Detail of vine-scroll panel on shaft of Camus's Cross. Detail of carved decoration on side panel of shaft of Camus's Cross. 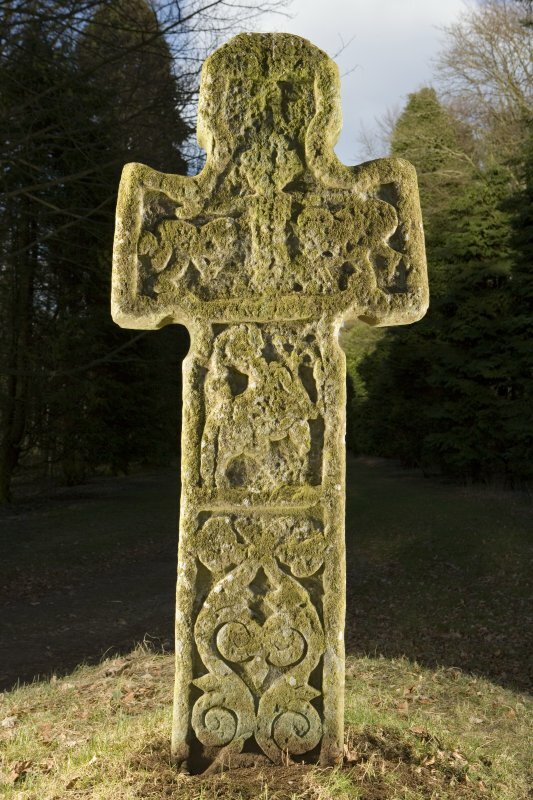 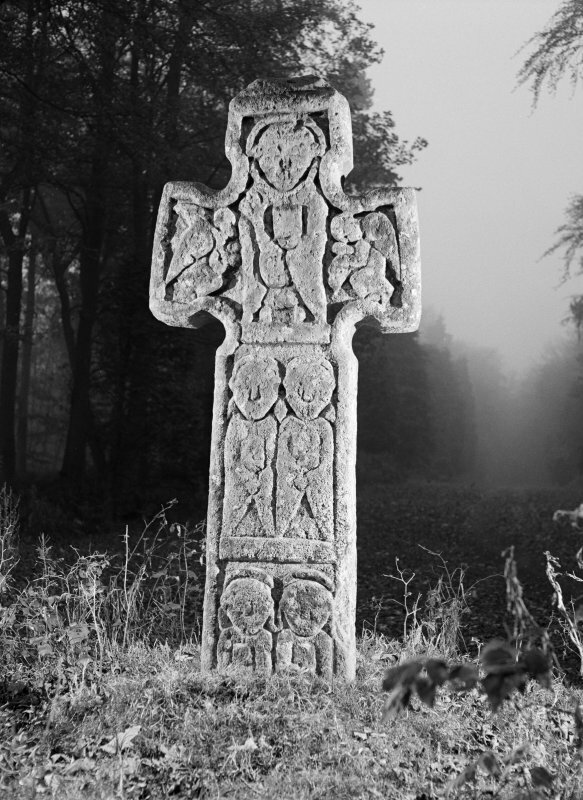 View of face of Camus's Cross. 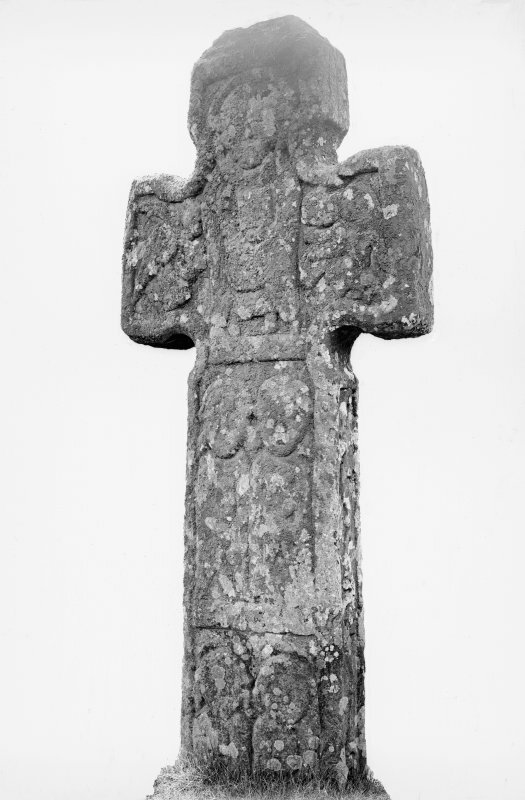 View of reverse of Camus's Cross. 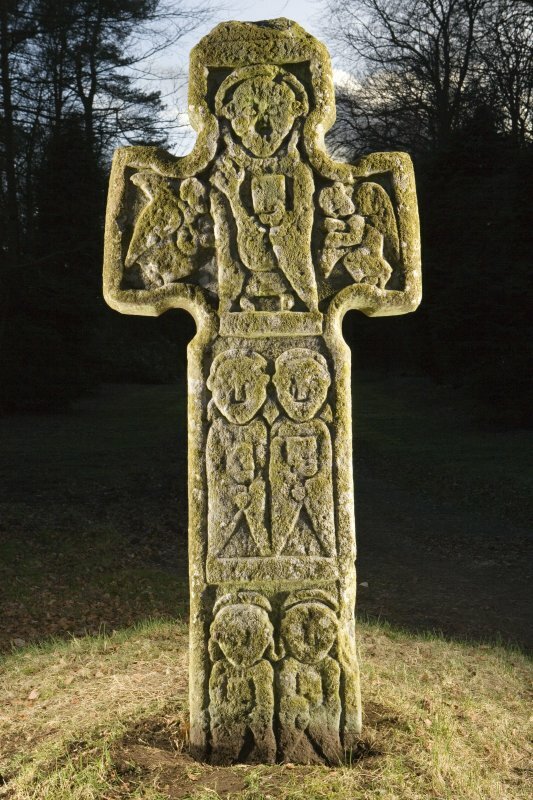 The Camus Cross (Class III), 6' high and sculptured, stood on a small tumulus which was opened by Sir Patrick Maule about 1620, and found to contain a skeleton, bowl-shaped food vessel, and a broad, oval gold ring which Anderson suggests was a pommel mount for a bronze dagger, comparable with that found at Gask Hill, Collessie (NO21SE 14); the urn and ring are in Brechin Castle. 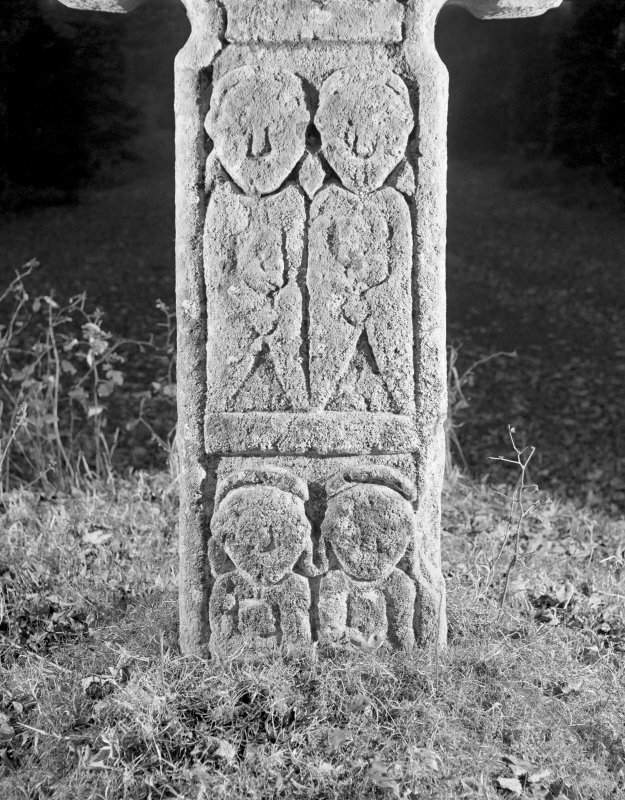 A J Warden 1881; J Anderson 1886; J R Allen and J Anderson 1903. 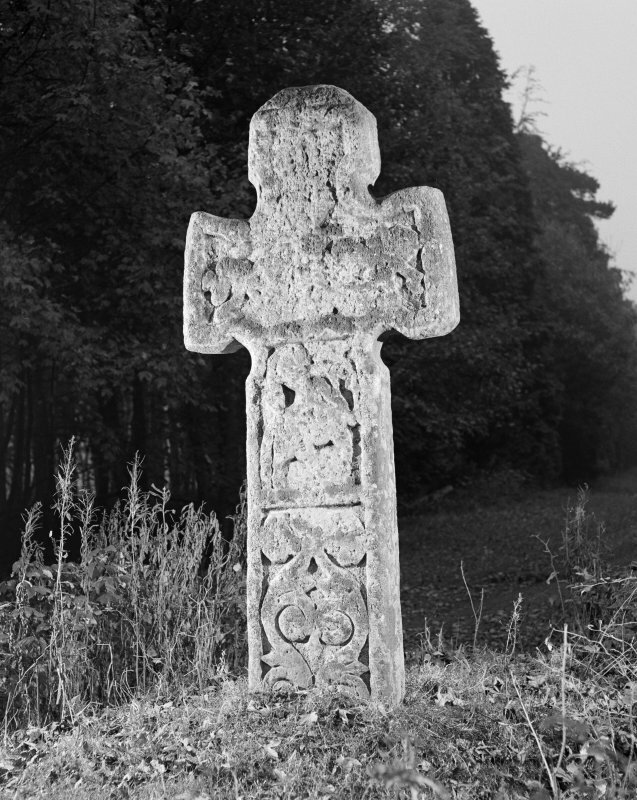 This cross stands on a small (? 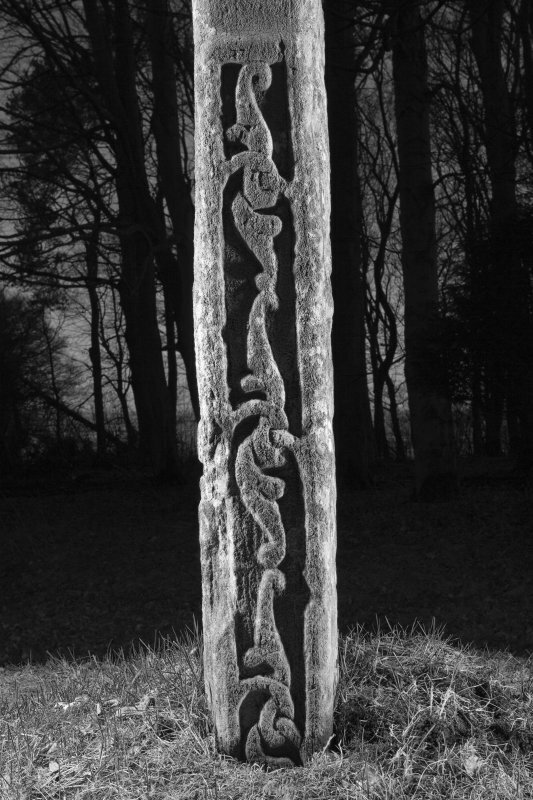 modern) mound measuring 7.5m E-W x 4.4m x 1.0m high. 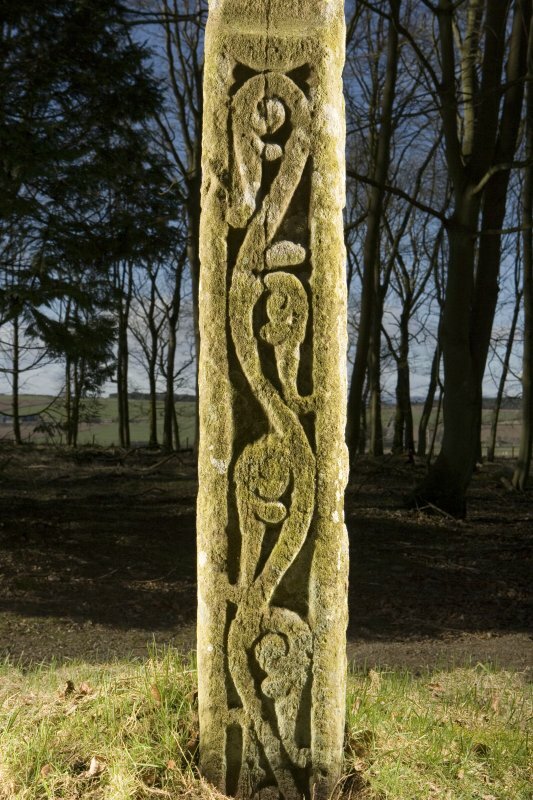 Facing E-W, it measures 2.0m high with arms 0.8m across; it is 0.2m thick. 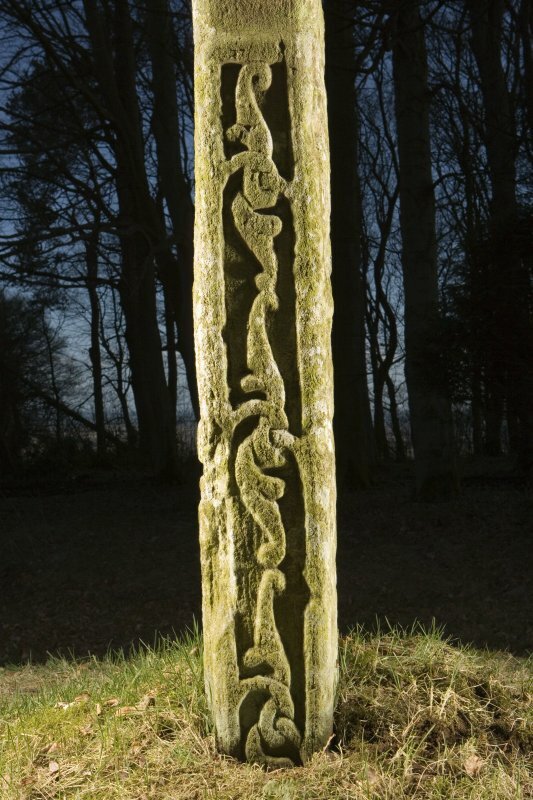 The sculptures are best preserved on the E face and N and S sides; it is weathered on the W face, but the symbols are still discernible. The tumulus was probably cleared away when making the avenue.